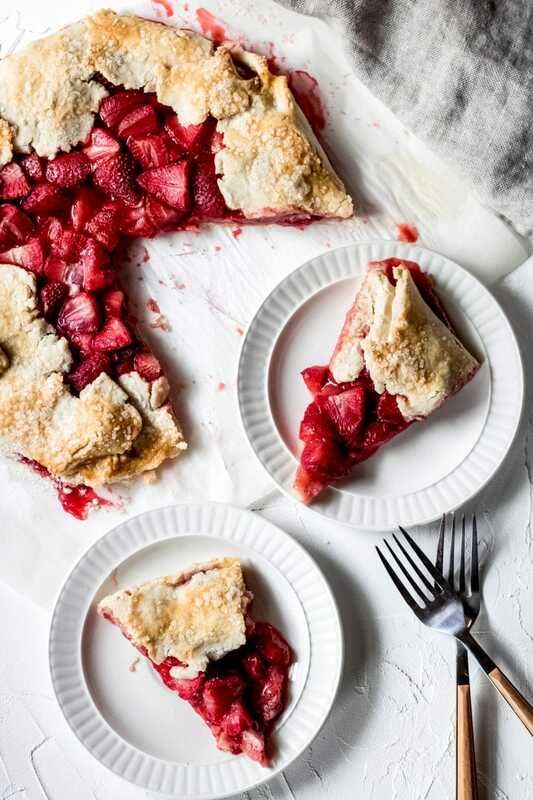 Don’t let gluten-free baking scare you – this Gluten-Free Strawberry Galette Recipe will show you just how easy it is to bake deliciously gorgeous gluten-free desserts. Plus, each of our gluten-free galette recipes featuring an easy to make gluten-free crust. 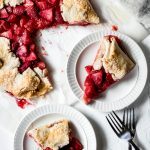 This fresh gluten-free strawberry galette recipe is perfect for using up all of that summer strawberry produce! Whether it’s Easter dinner, Mother’s Day brunch, or a summer picnic, this galette will be a crowd pleaser. Do you grow your own strawberries? 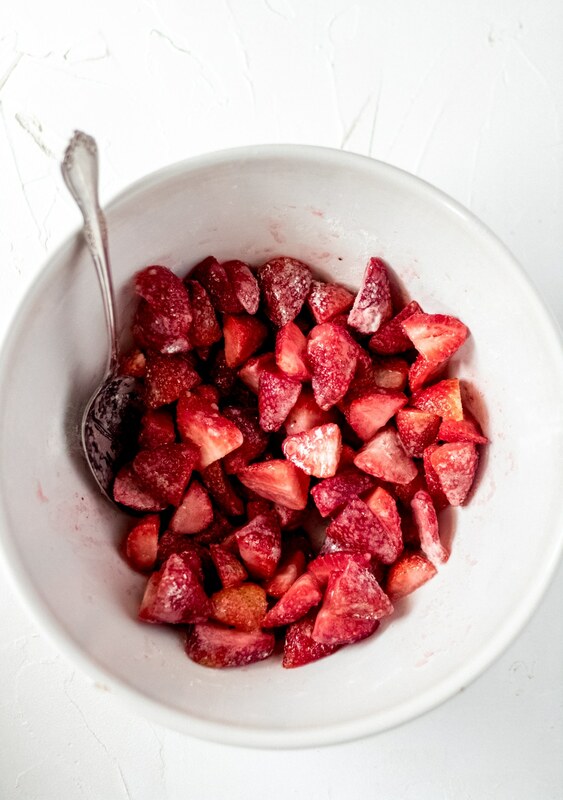 I know you can typically find fresh strawberries year-round in most grocery stores, but growing your own patch of fresh strawberries – well, there’s just something about going out into your backyard and gathering up a bowl full of gorgeous red strawberries. Plus, they are so easy to grow and multiply FAST. If you grow your own, you know that late spring into early summer is the perfect time for an abundant harvest of fresh strawberries. 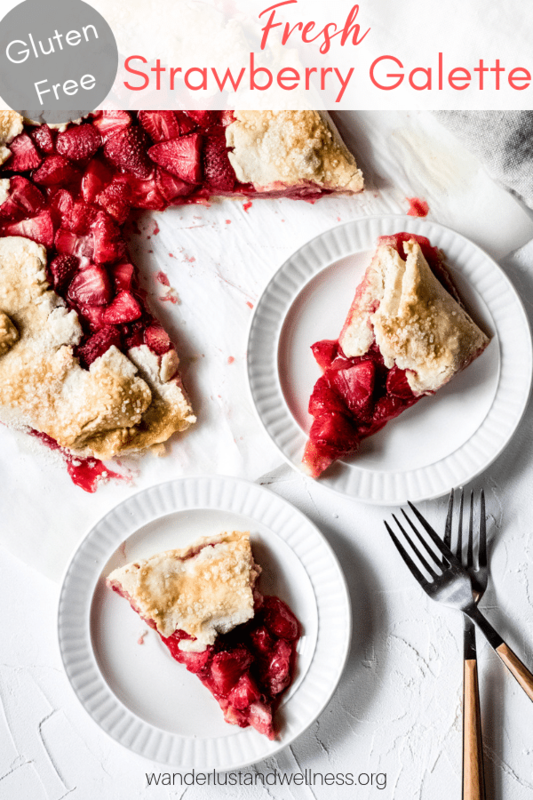 Whether you grow your own or not, this gluten-free strawberry galette recipe is the perfect gluten-free dessert for spring and summer. In a large mixing bowl, combine flour, sugar, and salt. Cut the butter into cubes and add to flour mixture – then, using a pastry blender or fork, cut in the butter into the flour mixture until you have coarse crumbs. Add water to the flour mixture. Add the cold water, stirring with a fork, until the dough comes together. If needed, add additional cold water 1 tablespoon at a time. Press the dough into a ball or disc, wrap in plastic or beeswax wrap, and refrigerate for 20 minutes. 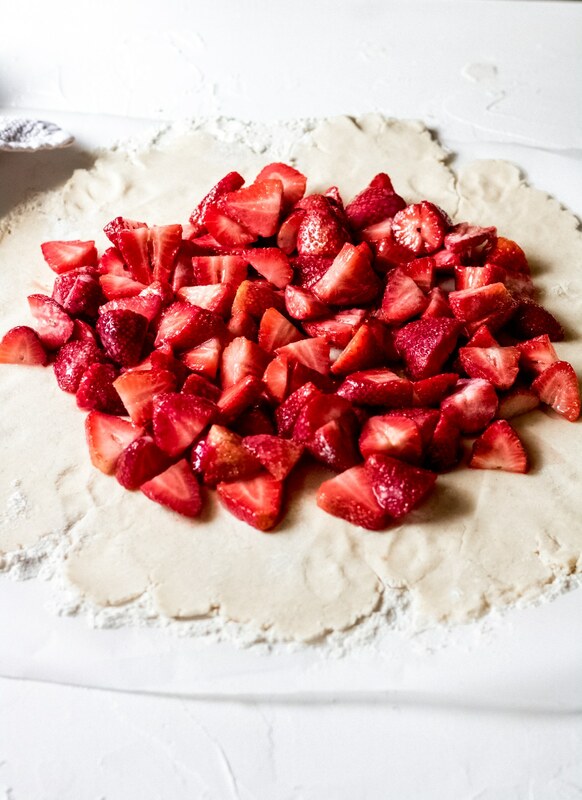 While the dough is chilling, add the strawberries, sugar, and arrowroot powder to a large mixing bowl and gently stir to combine. When the dough is ready, lightly flour a sheet of parchment paper and place the dough ball onto the floured surface. 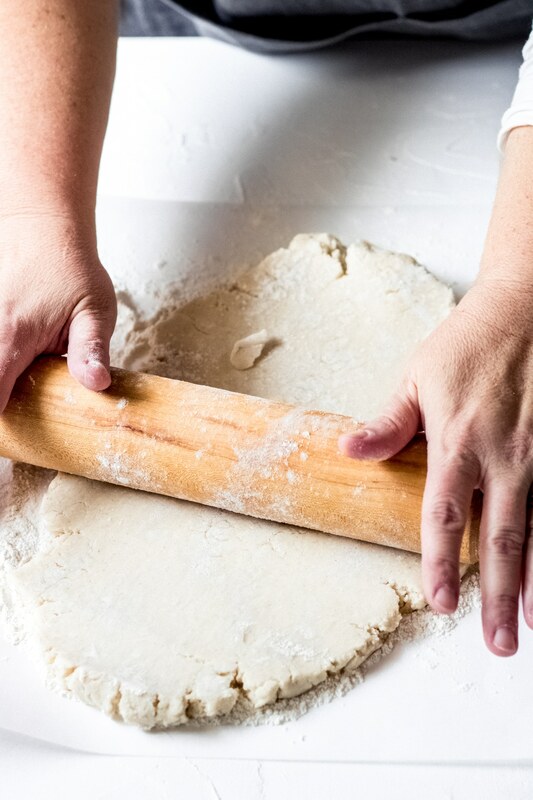 Then, either cover the dough with another sheet of parchment paper or using a floured rolling pin, roll out the dough into a large 12-14 inch circle. 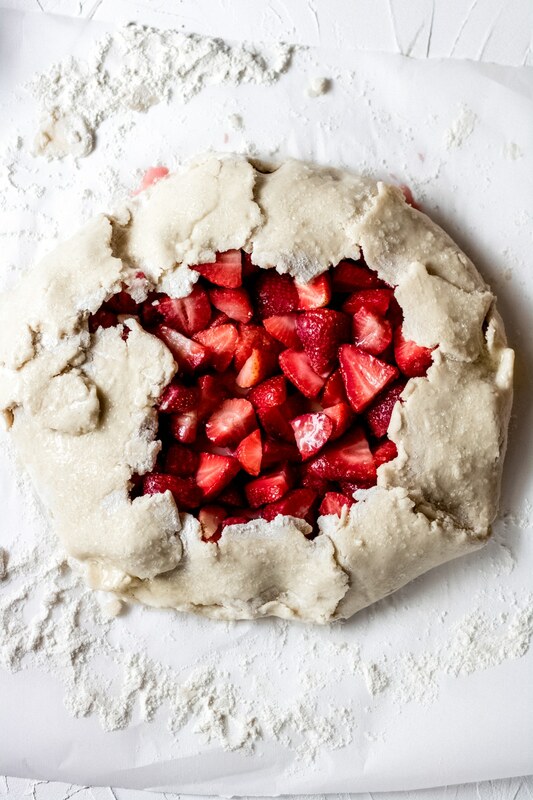 Spoon the strawberry filling into the center of the rolled dough. Carefully begin to fold up the edges a small section at a time. As you fold, let them naturally fold in. There most likely will be cracks along the folds – simply pinch them together. Whisk one egg white and then brush the egg white around the edges of the crust. Sprinkle sugar over the top of the galette. 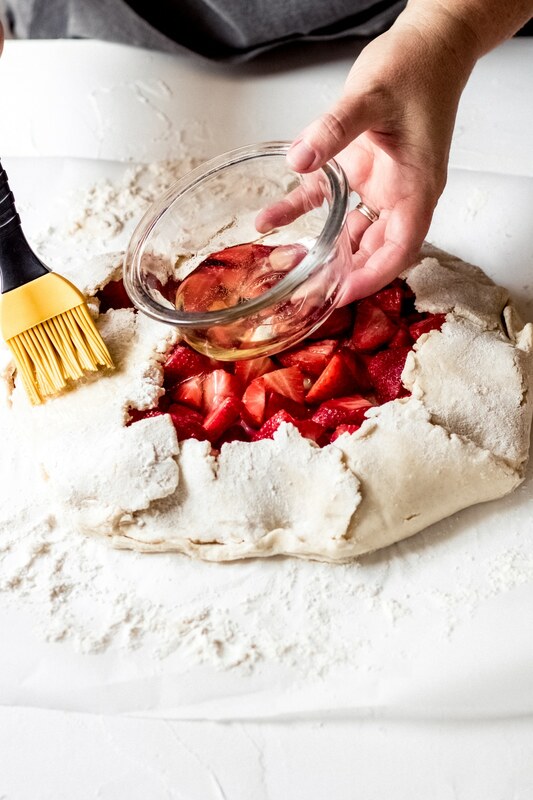 Carefully transfer the parchment paper to a baking sheet – trimming the edges so that it is not hanging off the sides – and bake for 30 minutes or until the crust is golden brown and the fruit center is hot and bubbly. Can I freeze the galette before baking? I would suggest freezing the dough ahead of time if needed, but not the entire galette. The tightly wrapped dough can be frozen for 2-3 weeks. 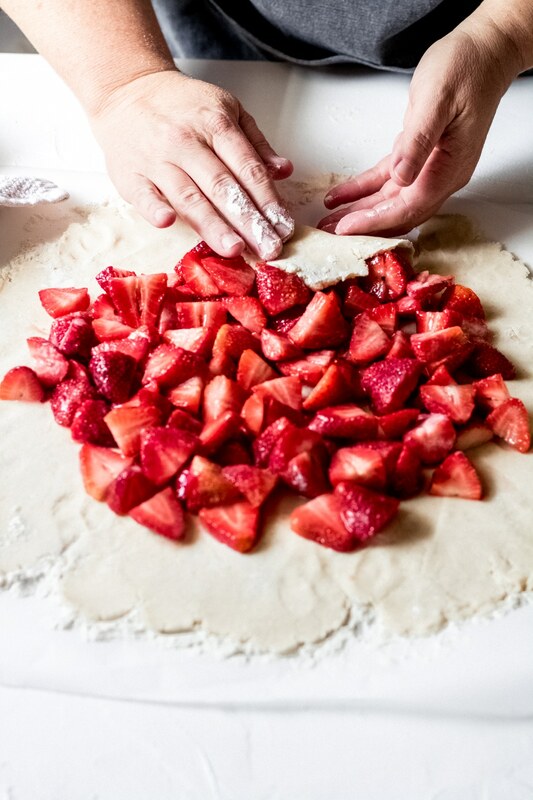 When you’re ready to bake the galette, remove the dough from the freezer and let soften at room temperature – then proceed with making your gluten-free strawberry galette. How do you reheat a galette? To reheat an already baked galette, transfer to a baking sheet and bake for about 15 minutes at 350 degrees F.
If you store the galette covered at room temperature, it will last for about 2-3 days. To last longer, cover and store in the refrigerator for up to one week. Enjoy these other spring-inspired gluten-free desserts! 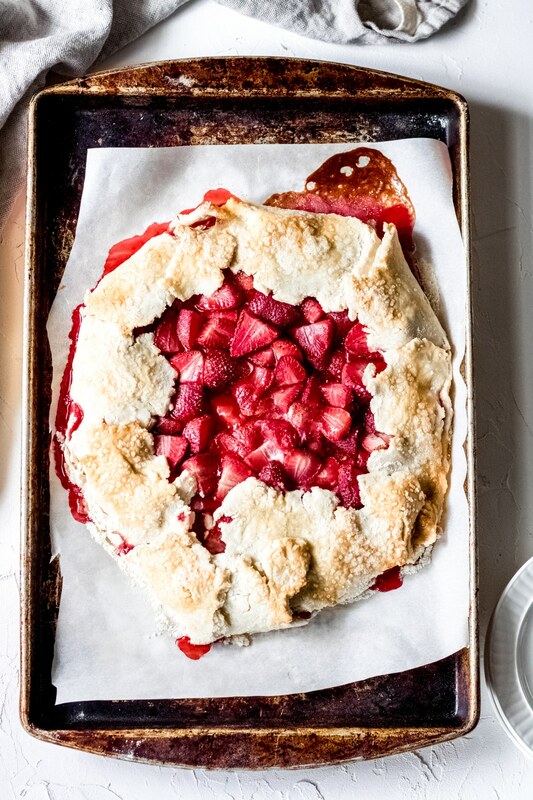 Spring is in the air with this gluten-free strawberry galette recipe – a beautiful gluten-free dessert made with fresh strawberries. In a large mixing bowl, combine the flour, sugar, and salt. Next, cut the butter into cubes and add to the flour mixture. Using a pastry blender, cut the butter into the flour mixture until you have coarse crumbs. Next, pour the cold water into the bowl and stir with a fork until the dough comes together. If needed, add additional cold water 1 tablespoon at a time until the dough comes together. Press the dough into a ball or disc, wrap with plastic wrap or beeswax paper, and refrigerate for 20 minutes. While the dough is chilling, add the filling ingredients to a large mixing bowl and gently stir to combine. When the dough is ready, lightly flour a sheet of parchment paper and place the dough onto the floured surface. Then, either cover the dough with another sheet of parchment paper or use a floured rolling pin to roll the dough out into a 12-14 inch circle. 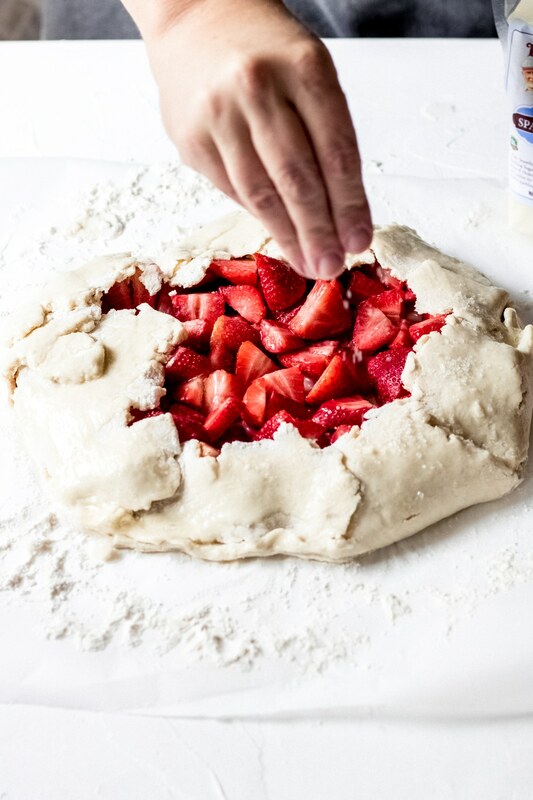 Spoon the strawberry filling onto the center of the dough. Carefully fold up the edges of the dough, letting them naturally fold in. Cracks are normal and you can simply pinch them together as you fold. Whisk one egg white and brush onto the edges of the galette crush. Then, sprinkle with decorating sugar. Carefully transfer the galette, parchment paper included, to a baking sheet and bake for 30 minutes or until the crust is golden brown and the filling is hot and bubbly. If you do not have arrowroot powder you can swap out for corn starch. If you do not have decorating sugar you can use regular granulated sugar.